The author continues to discuss an important subject – the impact of stress on the human body. In contrast with the previous piece which is pure nonsense and published in December of 2018, in this article the author raises important aspects of somatic rehabilitation. For example, the role of the phrenic nerve as a bridge with somatic and visceral systems and presence of viscero-somatic reflexes. At the same time, unscientific claims by the author continue to be present and their only justification is the author’s references to his own publications in Massage Today. It is very sad when misleading information is supported by the author’s previously published misleading pieces as legitimate reference material. A good, but very basic article on types of muscle contraction and workload. Yes, tests which the author suggested to examine collateral ligaments of the thumbs are correct. However, the article left the impression that these tests indicate only damage of collateral ligaments and this is a completely incorrect assumption. These tests will be positive in the exact same way if the patient suffers from osteoarthritis of the thumb’s joints or from the inflammation of periosteum (i.e., periostitis). Thus, it is clinically incorrect to link these tests only to strain or damage of collateral ligaments as was suggested in the article. A very good article on the rarely mentioned subject of electric vibration as a tool to decrease muscle tension, diminish protective muscle spasm and maintain proprioception. We may also add that there are two types of vibration which affect our body and muscle tension differently. Since Pacinian corpuscles (i.e., receptors which detect vibration) are rapidly adapted receptors fixed, true vibration will decrease muscle tone while mobile, percussion type of vibration will slightly increase muscle tone. In a clinical setting, fixed true vibration is used, for example, as preparation for Trigger Point Therapy while percussion-type mobile vibration is an excellent tool to address the soft tissue rehabilitation in patients after strokes or with peripheral neuropathy. The author correctly describes a local case of plantar fasciitis due to the trauma and overload in young athletes and its local treatment. A good educational article in regard to endotoxemia. We gave such a strange rating to the article because from one point the author is completely correct, but at the same time she makes a similar generalization mistake she tries to critique. In short, the knee and hip joint replacements indeed reached epidemic proportions. The author is also partially correct when she is talking about the moment when the joint replacement surgery was recommended to patients for the first time. We said ‘partially’ because there are many responsible orthopedic surgeons who are doing a great job to postpone joint replacement surgery as late as possible when it is absolutely necessary. Thus, ‘none of these physicians’ is overreach. However, the author is correct when she mentions a large number of completely unnecessary surgeries which can be prevented by therapists who should detect and address the initial trigger which may mimic joint pain and dysfunction. The author provides her own clinical cases as illustrations and she is correct again. Indeed, difference in length of the lower extremity may contribute, trigger or mimic joint degeneration. The author deserves credit for her passion to the profession and don’t be afraid to speak out. In this section the author, based on her own clinical experience, concluded that the difference in length between both the lower extremities is a conclusive factor in the therapist’s decision to address the soft tissue abnormalities first and thus prevent the knee or hip joint replacement surgery in the future. This is incorrect and a professionally risky generalization. Yes, for some patients the difference in the length of lower extremities is a sign that its correction will restore biomechanical functions of the joint and by unloading pressure therapists may save the patient from the unnecessary surgery. However, all patients with severe destruction of the cartilage and subchondral bone, due to Osteoarthritis (OA), will always exhibit shortening of one leg. Let us illustrate this point since it was completely missed in the article. Fig. 1 illustrates X-ray of the normal left joint. 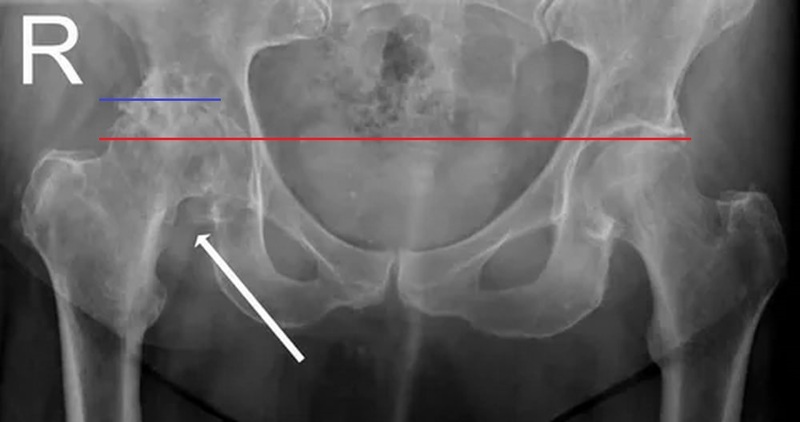 Pay attention to empty space between the tip of the femoral head and acetabulum (space between two small red lines). In the real joint this space isn’t empty, but it is filled with cartilage which covers both bones and it is translucent for X-rays. You may split this space in two and the upper half is cartilage which covers the acetabulum and lower hand cartilage which covers the head of the femur. Fig. 2 illustrates X-ray of entire pelvis and normal hip joints. Pay attention to the red line which indicates that both joints are on the same level and there is no difference in length of both extremities. Fig. 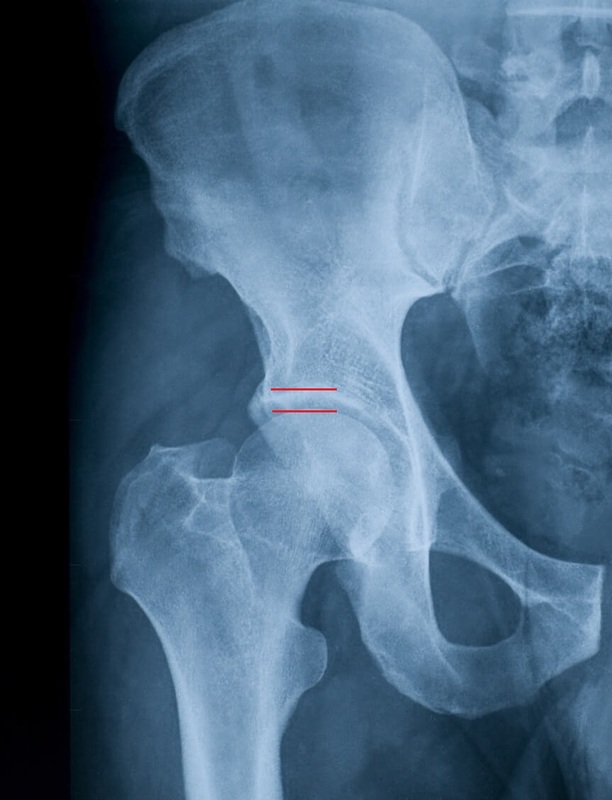 3 illustrates the X-ray picture of severe right hip joint distraction due to osteoarthritis. All cartilage is gone due to complete degeneration of the hip joint due to OA (no space between both bones) and also please notice proximal displacement of the entire right femur (tip of the femoral head above the red horizontal line on the level of blue line). Fig. 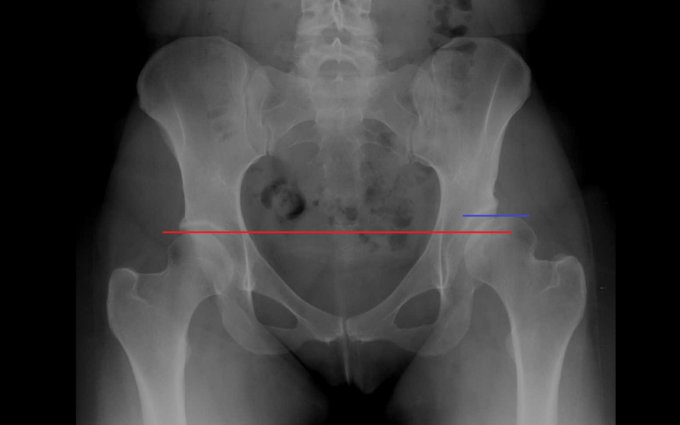 4 illustrates X-ray picture of left Hip Dysplasia which sometimes can be missed in infancy and left femur now is displaced proximally with the tip of the femoral head also above the horizontal red line on the level of blue line. Both patients illustrated in Fig. 3 and Fig. 4 will exhibit same clinical symptoms of shorter leg on the right and left side respectively. 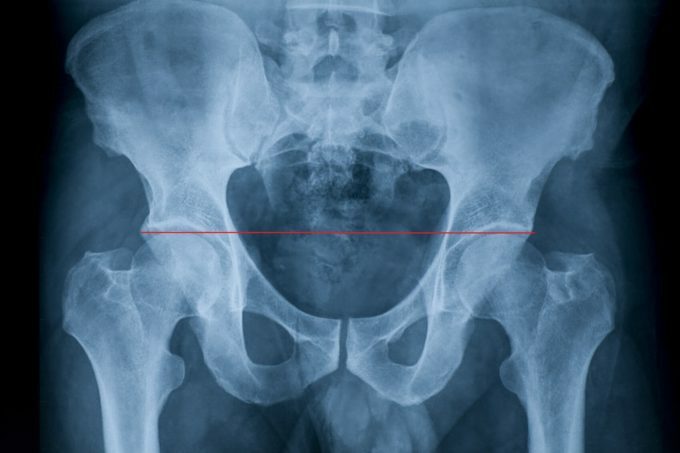 If the therapist acts according to the recommendations from the article and promises results by working with the soft tissues in the goal to restore length of both extremities, he or she will mislead the patient and deceitfully take payment since the only solution is full hip replacement to the patient illustrated in Fig. 3 and corrective surgery or hip replacement for the patient in Fig. 4. Our Conclusion: measure length of both extremities, but never consider difference in length as a decisive factor in promising stable clinical results. It may work for some patients mentioned in the article, as examples, but it can be also a waste of your time and reputation as well as the patient’s money as we illustrated in clinical cases which are frequently observed. Difference in length of lower extremities must be examined with other tests and evaluations to prevent treatment mistakes. This article sounds like a promotion piece to seminars enrollment rather than a clinical or education piece. This article generally discusses Neural Reset Therapy (NRS) and promotes seminars. NRS is a legitimate part of somatic rehabilitation which unfortunately is seen by some as a silver bullet to successful rehabilitation. It should be part of the treatment process. There are different ways to engage H-reflex which is associated with short lived decrease in muscle tone. They are very well known and studied clinical tools since the 1960s. NRS is very easy for therapists and a helpful way to use this reflex as part of the treatment process. Please see NRS from this perspective when it works with other modalities rather than the ultimate answer to stable clinical results. Mr. Alexander continues to spread his ideas which don’t exhibit common sense and physiological grounding. There is nothing to add about this piece since we already reviewed Part I in the previous issue of JMS. This article is a basic discussion of TMJ dysfunction and it barely touches treatment options. However, to be fair, the author mentions that this is an introductory article. Another aspect of TMJ dysfunction is completely missed. When the author discussed causes of TMJ dysfunction the mild irritation of the minor occipital nerve was not even mentioned despite that this is one of the most common hidden initial triggers. A good article about anatomy, function and palpation of the trapezius muscle. An excellent article which reviews all approaches to the examination of abdominal and extra-abdominal parts of the psoas muscle. Excellent illustrations. A very unusual view on the psoas and somatic integrity in general. A very good article especially in regard to Spondylolisthesis. Some therapists are not aware of this complex condition and can aggravate its symptoms while trying to help a client. There is no doubt that this article touches an important subject since MT indeed is an irreplaceable tool for orthopedic doctors to use in conjunction with their work. MT can decisively restore function, help prepare tissues for surgery and dramatically speed up recovery after it. However, it seems the article is written to laymen readers rather than professionals in the field. The article includes many general statements and descriptions with occasional ‘professional tips’ which don’t make any sense since they are short pieces of data trying to fill up a clinical void within the article. The only positive part is the presence of some references at the end.